I thought that was super kind and thoughtful of her. I know all of you parents of young ones right now, are like, Noooooooooo. I smiled, ignoring all of my anti-princess-no-Barbie-doll-feminist-leaning tendencies. “She will love it.” I said. Elena’s big eyes and curious fingers, wasted no time in figuring out that blue button. Elena was tiptoeing around the kitchen with her singing Elsa, who she calls “ah-chay,” twirling high above her head. She was mesmerized. And I was kinda dreading the next 6 days our trip. I wouldn’t exactly say I am anti-Disney princesses, but I am definitely not for them. I don’t like the message they portray to young girls. The whole princess-culture, that says your worth is based on your external beauty. It seems to only reinforce what so many woman and girls grow up fighting against. I sighed loudly, expecting him to nod along and agree with me, but he didn’t. “Michelle, she’s not even two. “ok. You’re right. She’s not even two.” I repeated to myself as I imagined her singing ‘Let it go’ for the next 10 years. 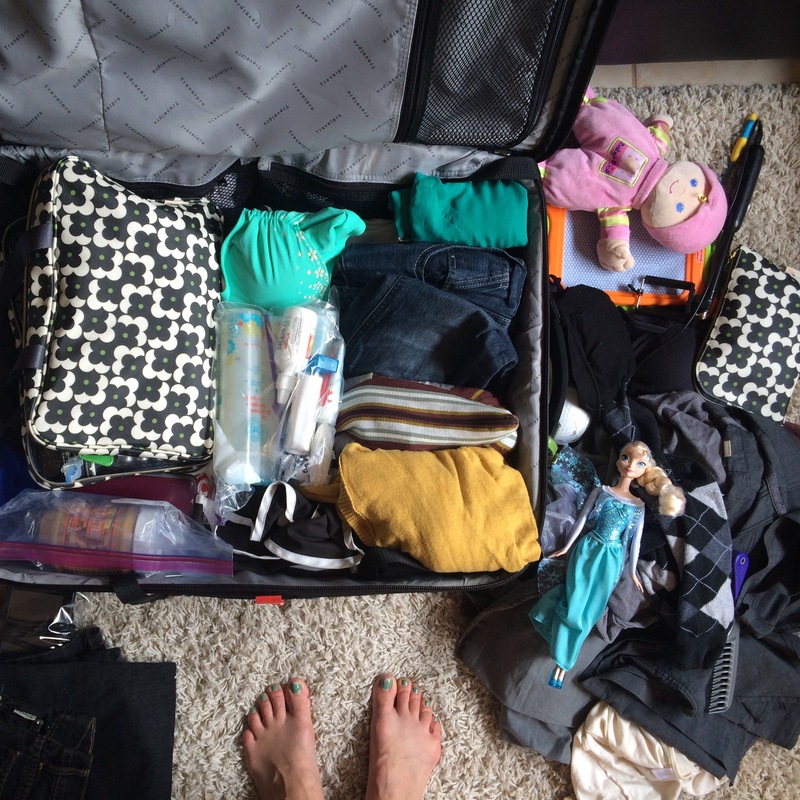 We got home last week and while un-packing my suitcase, I came across the singing Elsa doll. I was tempted to hide it. She won’t remember if Elsa just “disappears,” I thought. I don’t want my personal preferences to get in the way of paying attention to what my daughter likes. And right now, she likes Frozen. So I will play with Elsa and talk about Anna and Olaf and buy her Frozen pajamas and underwear because she likes it. I will enter her world because that’s the only way I know how to really understand someone. Sure, as the parent I will set boundaries. We will not watch Frozen every day. But I will care about Frozen, because she cares about Frozen. And if in five years she starts caring about inch-worms and frogs and beetles, I want her to know I will do my best to care about those things too. If in nine years she comes home from school crying because she didn’t get invited a friend’s birthday, you better believe I will provide hugs and empathetic nods. I will care because she cares. Feeling left out of a birthday party is sad and hard at any age, but especially when you’re nine. And maybe in twelve years, if she starts caring about a silly boy band, I will care about that silly boy band, too. I will listen with her and try to remember their names and let her put up posters in her room. And if in seventeen years, her interests move on from a boy band to an actual boy, I will tell her he’s welcome to come over. I will place my hand on her daddy’s arm for reassurance, and show her that if she cares about someone we will, too. If in twenty-one years she comes bouncing in talking about an internship where she gets to study malaria prevention, but all I hear is “gone” “whole summer” and “not-deadly,” I will keep my thoughts to myself and congratulate her. I will hug her and ask her to tell me more. Because if something makes her this excited, I will want to understand why. And if in twenty-five years she says she wants to move to another country, one where I don’t speak the language or understand the culture, my heart might sink for a second, but I will buy a plane ticket to visit and see her life. I will pray for her protection and growth, not that she changes her mind. I will sit awkwardly waiting when I don’t understand what’s being said and watch as she lights up, explaining to the taxi driver where we’re going. Because loving someone means caring about what they care about. It’s easy as parents to see our children for who we want them to become, but I think it’s sometimes all too easy to miss who they are right now. That’s why we need other people, a spouse, a friend and an observant older mom, who may see interests that we may not. You know, a fresh pair of eyes to notice how much a certain little one loves singing ‘Let it go.’ The truth is I can introduce my daughter all day to books, and climbing and colors and picking flowers. And I can hope that one day she’ll learn how to play the piano or join a soccer team, but for now she loves putting her baby dolls “nigh nigh” and singing with Elsa and Princess Anna. And that is just ok.
Gerber and I talk a lot about how in community development work, before people care what you know, they want to know that you care. And I think the same in true in parenting. Of course I want to teach our little girl all kinds of things, but I know before she is ever going to care about what I know, she has to know that I care. So I will start by caring about the singing Elsa Doll.